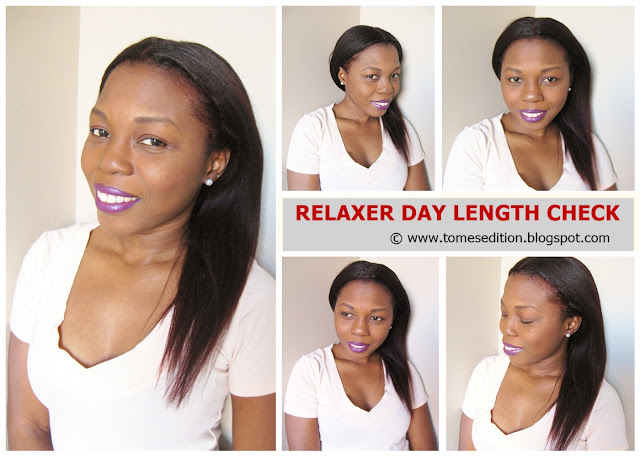 After a long exhausting day with relaxing your hair, doing a length check is one of the most rewarding part of the process. 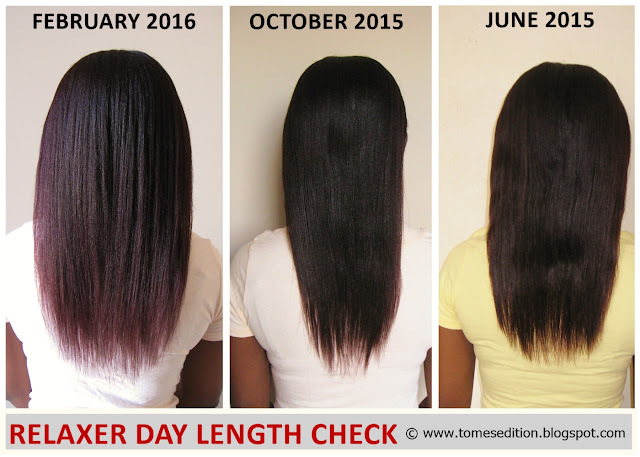 We all want to know what progress we have made after stretching our relaxer. 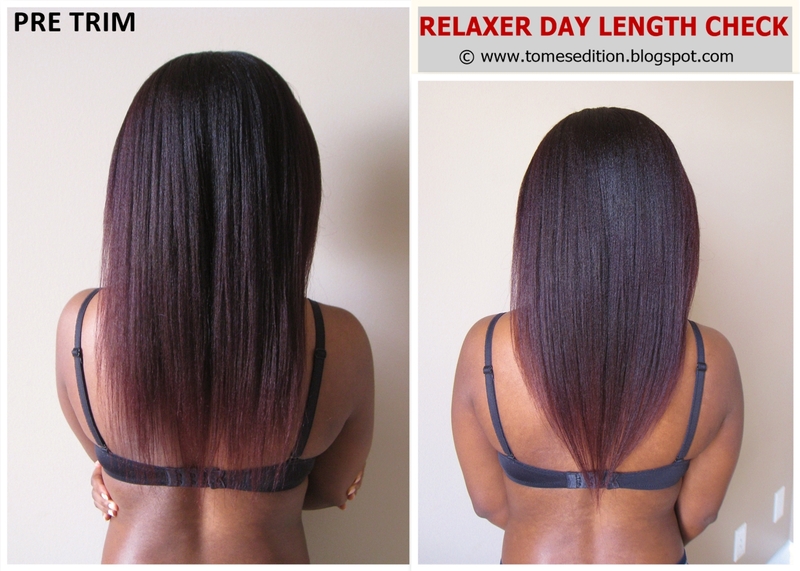 If you haven’t seen my relaxer results go on and check it out here. Even though I deep conditioned my hair weekly during this stretch, my ends were terribly affected from a previous stretch and since I barely trimmed last relaxer touch up, a trim was necessary this time around. The pic above was taken post trim and my ends and hair felt and looked better. Let’s take a look of how my hair looked after flat ironing my hair the following day below. You can clearly see, my see through ends needed to go. I opted to use the feye method to trim my hair plus my hair still has the U shape from my professional trim done last April and this method keeps that shape. I pulled the scrunchie downwards to get a better understanding of how much I wanted to trim. I'm by no way scissors happy but I bought a new one recently and needed to test it out. After trimming off an inch of my ends, I pulled each section of my hair in a horizontal direction and trimmed to even out my ends. That’s how my stylist trimmed my hair back in April. After trimming, this is what my hair looks like below. It was interesting to see my hair looked the very same length as my pre trim length (scroll up and see) which is nothing but crazy. I also noticed my hair looks thicker as my back is completed filled in from my shoulder to my bra. It looks like I’m still hovering over my bra but not completed covering it with my hair. I asked my husband to trim some more with my hair combed back but he doesn’t like trimming my hair and tells me to go to a stylist. You can see my bone straight ends in my ponytail but my strands are not split, so I’m leaving them and trimming off and inch or two every relaxer touch up to get rid of them. The angle of the photos makes my hair look thin but it really isn't. 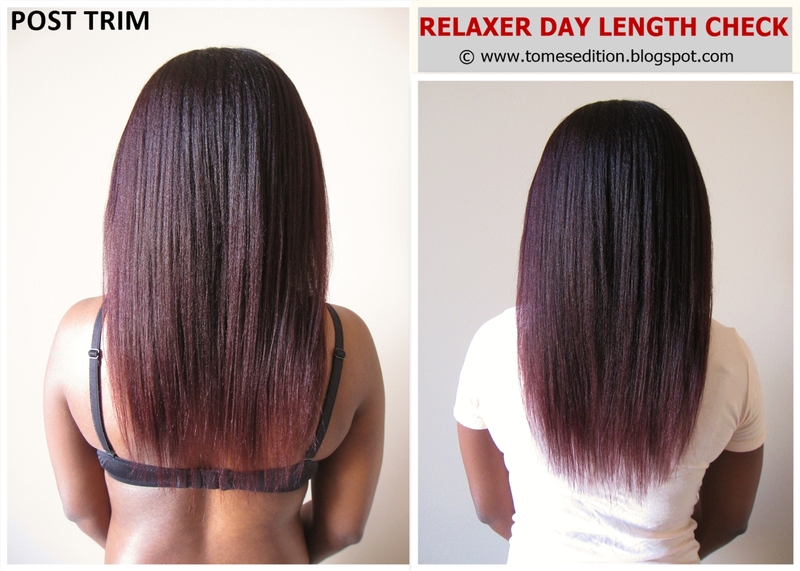 After my major cut last April I slacked on my regimen and you can see thinning in my June 2015 relaxer update. My hair suffered some more as seen in my October relaxer update. Thankfully you can see the power of weekly deep conditioning and taking care of my hair. My hair seems to be coming back to life. When was your last trim|cut? I'm obsessed with the colour of your hair, love it... Another successful relaxer day and your hair has grown so much... I too have bone staright ends to get rid of but like you I will trim an inch or two at a time as the ends are not unhealthy. Thank you Deonne, seems like we have the same plan. Your hemline is filling in! I love it! And I totally agree with DeOnne: THAT COLOR THO! So pretty! 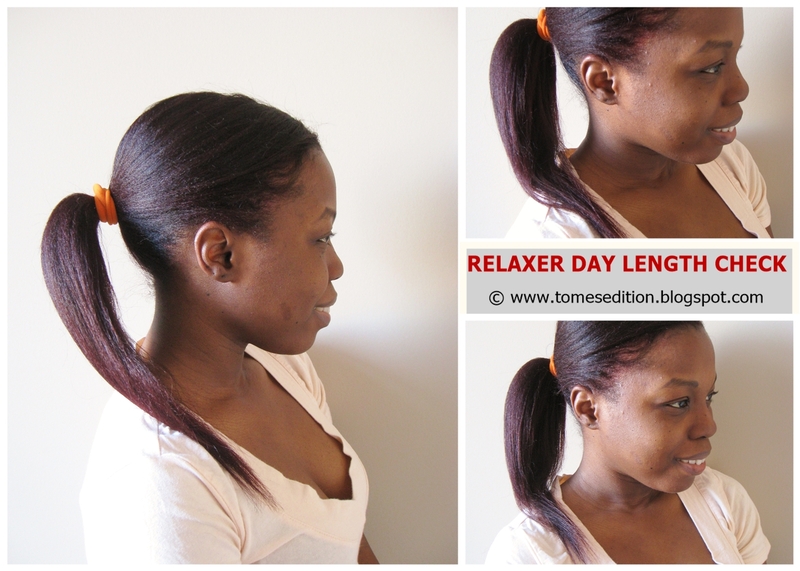 How long do you think that you'll stretch your relaxer this time? I agree! 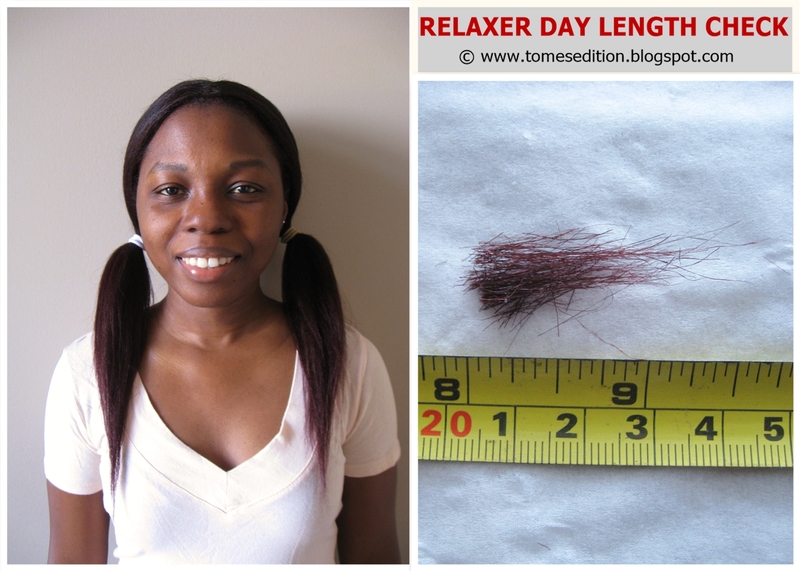 I love the hair color and your hemline is in amazing shape! My last trim was maybe a couple of months ago. I love how full your hemline is looking now. The trim was necessary, indeed. I have a problem with dry ends that don't curl up, so I trim whenever that happens. I don't worry much about length anymore. I love your hair color. Good growth dear, your ends look really look good after the trim. Your hair is getting healthier each time you do a reveal. My husband refuses to trim my hair too. 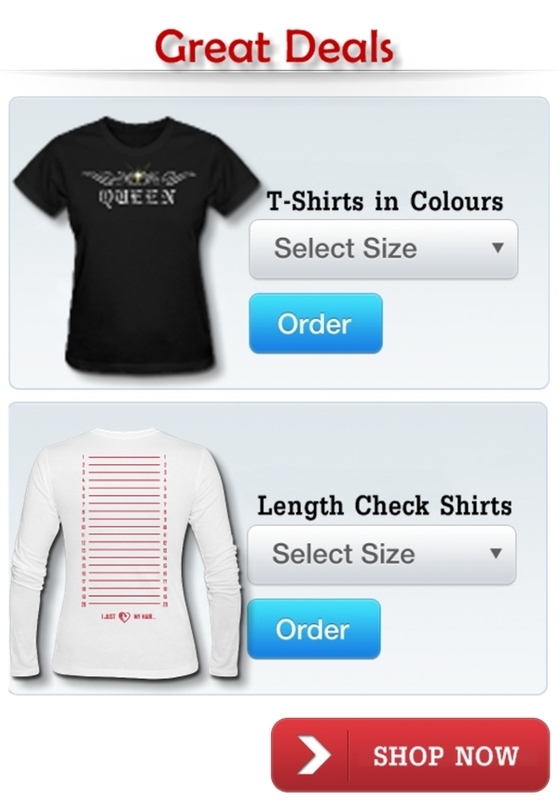 Maybe it's a guy thing. I'm pretty sure they don't want to mess something up and have us blame them. I use the Feye's method also. You look more like mid-back b/c your bra looks to be worn low. Our husbands are so alike. Jay don't make me jump through some hoops now about MBL. I actually always wear my bra there and I chose to wear this exact bra everytime for my length check. Am with Jay I think you are MBL, you are so past BSL! Oh wow your hair has come so far Tomi, this is absolutely amazing!! Don't make my blush, thanks Yvonne! It has definitely bounced back Tome!! That is beautiful hair.